I think the biomedical engineering program here has very diverse research areas among labs, and I really like the collaborative atmosphere. As a student interested in musculoskeletal research, my experience is not limited to the Department of Biomedical Engineering-I'm also able to work with people from the Department of Orthopaedics and the Center for Musculoskeletal Research. Why did you choose biomedical engineering? I like working with cells and tissues, and I also want to learn problem-solving skills, which will be useful in my future career. I am now a student in the Kuo lab. 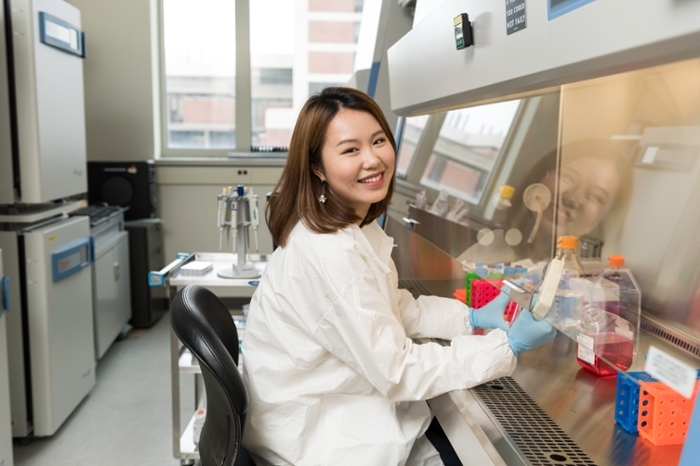 Dr. Kuo gives the students freedom to choose their own research focus, and she is very hands-on regarding to making herself available for meetings and discussions. Besides, I am personally interested in working with stem cells and tissue regeneration, so the research of this lab is intimately related to my research interests. What is your research project and why is it important? Our lab focuses on tendon research. Tendon injuries are a common clinical problem and tendon heals as scar tissue due to poor innate healing ability. My current project focus on LOX-mediated crosslinking of tendon, which is a critical contributor to tendon mechanical properties. Understanding of the mechanisms of LOX regulation during normal tendon developmental can be used to inform tendon healing, tendon regeneration and tendon engineering. By working with my advisor so closely, I think I have been learning a lot in a relatively short period of time. I was very excited when I completed each experiment and got data to tell an interesting story. The process of troubleshooting is also a great chance to learn something new. And since our lab is collaborating with surgeons and clinicians, and they have been coming to our weekly lab meeting, it is a great opportunity to work with people with different background and perspectives. I hope to continue doing research or scientific study whether I stay in academia or go into industry. But I would like to have different experiences in many different places. It is probably better to start as early as possible, but I will not be concerned until 3rd year or 4th year of PhD training. There are several organizations here that help student to get prepared for future careers that I will use as resources. My advisor also has a very broad network, not only in the tendon research field but also in many other fields of scientific research.